Help! 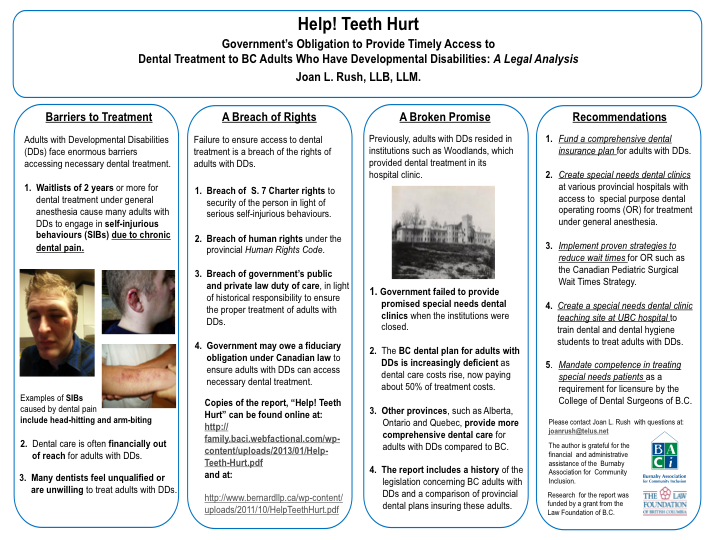 Teeth Hurt is a project and campaign that started because of the agonizing wait for dental treatment for adults with developmental disabilities. Help! Teeth Hurt won the 2015 UBC Your Evolution competition. Part of UBC’s start an evolution fundraising and alumni engagement campaign, your evolution, is a unique project-sharing platform that supports the many ways the 300,000-strong global alumni community is changing the world for the better. The your evolution website allows the UBC community to share details of socially beneficial projects and connect with fellow alumni, students, staff, faculty, volunteers and donors to find supporters and inspire others to make a difference. The website offers many ways for Help! Teeth Hurt to gain exposure. As winner of the 2015 competition, Help! Teeth Hurt won a professionally produced video to help promote the cause, as well as mentoring sessions with UBC experts. We are pleased to feature the Help! Teeth Hurt video on our www.helpteeth.org website. Help! Teeth Hurt!! Creating a Specialized Dental Clinic for Adults with Developmental Disabilities was the winner of the 2015 UBC Alumni your evolution competition. Essentials (Magazine of the Canadian Dental Association) p. 26-32. Includes an interview with Joan Rush, Director of Help! Teeth Hurt.